Music and Society, History, Psychology, Pedagogy, The Creative Process, Personal Reflections, and more. Many jazz masters left their footprints in their audiences’ hearts during the century that jazz has been alive, and their names resound loudly in the music of their followers: Miles Davis, John Coltrane, Charlie Mingus, Louis Armstrong, Ornette Coleman, Charlie Christian, Joe Pass, Jim Hall, Duke Ellington, Count Basie. These and many others have earned their roles as ambassadors of the New Orleanian style, and they can be found on diverse types of media, from CDs to magazines and history textbooks. Nonetheless, below the tip of the iceberg, hidden figures have developed innovative ways to create music that lie dormant waiting to be discovered: the music of the neglected jazz masters. One of these masters is the late Californian guitar hero Ted Greene, who stands out for several traits: a unique conception of solo-guitar arranging linked to baroque music, technical ability that allows him to play contrapuntal passages easily on guitar, a modernistic style in harmonizations, a wide timbral palette, his educational capabilities, and above all, a welcoming and humble personality that earned him the status of role model for some of the best guitar players in the world. As a lead artist, Greene released only one album in his entire career, Solo Guitar (1977), a collection of arrangements of jazz songs and traditional tunes. Each arrangement shows how Greene weaves several melodies into a smooth fabric, as for example, in “Danny Boy.” The following excerpt shows how each of the melodies can be independent and at the same time how they all fuse to create harmony. “Danny Boy” at 1:07. Guitar tuned a half step down (pitches sound a half step lower than written) with 6th String = D flat. Taking this technique further, Greene plays walking bass lines, chords, and melodies, all at the same time, applying this technique to both the head of jazz standards and solo sections. “Just Friends” and “They Can’t Take that Away from Me” illustrate Greene’s level of mastery on the instrument regarding this technique. Yet the guitarist does not settle for an arrangement in which many independent voices are simply present. He also shapes the character of each line according to its role. The walking bass line sounds as played on a double bass, and the soprano voice stands out as having a main role. Greene achieves this effect by considering mannerisms that stem from other instruments’ characteristics. Because the strings of the double bass are harder and thicker than those of the guitar, they offer more resistance to the left fingers. As a consequence, on a bass, a string might start vibrating after a finger leaves it, as it suddenly returns to its original position in the absence of a pressing force, and the sudden movement of the string results in the beginning of a vibration cycle. This phenomenon results in the brief unintentional sound of the open string while the bassist changes the position of a left finger to a new note, and the outcome is a percussive effect in between beats, which the bass player may intentionally regulate into a triplet subdivision to make it part of a jazz tune’s groove. Although guitar strings do not offer such a strong resistance to a performer’s fingers, knowing that the bass’s percussive effect has become part of the jazz style and not only a consequence of a physical impediment, Greene imitates the effect by intentionally letting the lower open strings sound in between notes. This consideration allows Greene’s arrangement to convey the illusion of a bass-guitar duet. On the other hand, notes of the soprano voice are carefully sustained while lower voices are played. While this is standard practice in an ensemble setting or a piano solo arrangement, guitar limitations make this approach a non-idiomatic resource. Probably the greatest influence on Greene’s capacity to deal with many voices and treat them independently was his study on baroque and neo-baroque music, two styles that reside in polyphony. Ted Greene’s knowledge of baroque and neo-baroque has been widely reported on several media, including TedGreene.com: The Legacy Lives On , a central source of information where Greene’s own students regularly receive, collect, and post private lesson material dealing with many guitar topics. Greene directly talks about the connection between his solo arranging approach and baroque music in his 1993 master class, available on Youtube as “Ted Greene 1993 GIT Seminar pt. 3,” which took place at the Guitar Institute of Technology, an affiliate of Music Institute of California: “the root movements of Bach… those are just like those old standard tunes…. These kinds of progressions… have been around for a long time. It’s still the same stuff,” he says as he improvises a walking bass line, solo line, and chords on “Autumn Leaves” (6:25). Greene also explains his conception of Bach’s music: “Implied chords. That’s what Bach did. Bach teaches us that his music is about chord tones that are stitched together with either scale tones or chromatics, and the genius is that there are motifs binding it all together, themes… but if somebody wrote in a similar style but didn’t use actual themes, they could still get the effect of the harmonic environment of a Bach, if they knew his harmonic vocabulary” (2:41). Based on all these accounts, it is possible to establish that Greene’s interest in and knowledge of baroque music aided him in the development of his solo arranging style capable of polyphony. Additionally, the incidental connection between jazz and baroque music through similar chord progressions (cycle of fifths) and moving bass lines (the baroque basso continuo and jazz walking bass line) made the music of Bach a practical model whereby Greene could develop mature arranging and performing techniques. Another of Greene’s musical incorporations in his style, taken most likely from jazz pianists, can be seen in his voicing choice. The introduction to “They Can’t Take that Away from Me” on Solo Guitar shows how Greene moves far away from typical guitar voicings. The progression constitutes a chromatic cycle of fifths that supports a soprano voice moving independently. Greene strategically selects rootless altered dominants of four or five notes, creating a dissonant texture by using the tritone and two of the dominant’s alterations or far extensions, such as the sharp ninth or the thirteenth. “They Can’t Take that Away from Me” at 0:00. Guitar tuned a half step down (pitches sound a half step lower than written). These quartal dissonant chords resemble Bill Evans’s voicings and are played within the uppermost frets of the guitar, a usually neglected area. Thus this approach addresses the need to incorporate universal jazz vocabulary beyond the resources that the instrument offers. 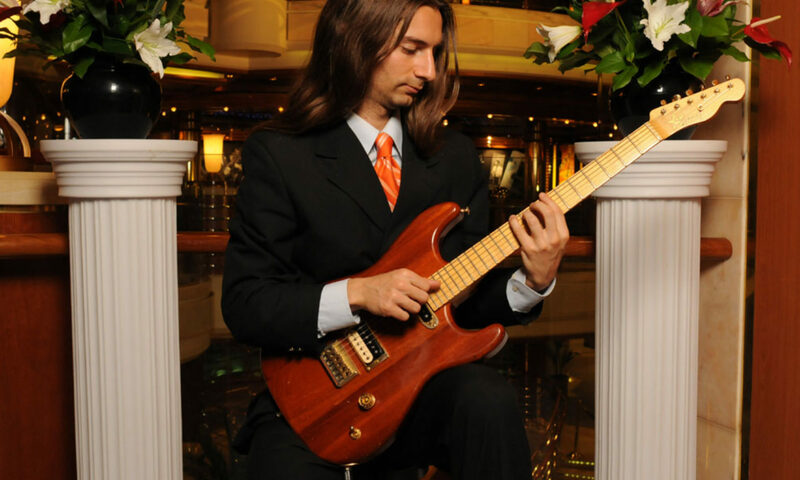 Ted Greene stands out as a solo arranger and performer by achieving polyphony on the guitar, giving different voices independent treatment simultaneously, and incorporating piano and bass resources into guitar playing. These accomplishments are all the more admirable when observed in the context of the year Solo Guitar came out, when nobody was doing anything similar at that time or before. Wes Montgomery had incredible command of the fretboard on chord soloing and captured a wide range of audiences with his particular touch, but he never established polyphonic textures, much less develop such an unusual stylistic crossover. A similar comparison could be made between Ted Greene and Joe Pass, who was a pioneer on progressions with walking bass lines but did not achieve the voice independence present in Greene’s style. Furthermore, Pass did not develop a technique that would allow him to play walking bass, chords, and melodies at the same time, although he was able to stand alone solidly and improvise on jazz standards with his own accompaniment. Pass and Montgomery’s music was significant in and of itself, and Greene’s development does not invalidate or diminish either performer’s accomplishments. Measuring artists against each other is like comparing apples and oranges, and competition is not the point of this observation, as all music has its own right to be enjoyed and preferred. Nevertheless, these contrasts point out that Ted Greene was indeed one of the greatest jazz masters of all times, as we can perceive in Greene a high degree of musicality development and unique innovative contributions to music and jazz guitar in particular. Six months after Ted Greene passed away, Guitar Player published the article “Vibrant Voicings: Ted Greene’s Tips and Examples” in the November 2005 issue, to honor the late master. Steve Vai, one of the greatest rock stars in the world, famous for his dexterity on the instrument, comments on Greene’s capacities: “Ted’s command of the instrument was supreme, and it was clear he had the deepest ears that music could flow through. He was not only defying the technical physics of jazz chord-melody voicings by playing melodies, chord changes, and bass lines all at the same time, he was making them all flow together organically. I would invite my friends over to listen to [ Solo Guitar ] and tell them that it was just one guy playing the guitar. They thought I was lying to them” (104). Innumerable Youtube videos show Greene developing arrangements while comfortably discussing music principles. Because of the great variety of circumstances in which the guitarist was playing, and considering each arrangement’s freshness and originality, it is clear that Greene had not only mastered solo performance skills. Ted Greene was able to improvise three-part arrangements. Beth Marlis, instructor at GIT, comments on this aspect of his technique in “Vibrant Voicings”: “along with two other GIT instructors, we found [Greene] crammed in the corner next to the desert tray [at a local restaurant] playing the most amazing improvised counterpoint medley—a solo guitar tour the force that spanned multiple styles and stretched for 45 minutes in an unbroken stream” (107). Vai also recalls Ted Greene playing “The Star Spangled Banner”: “He went through it about four times completely, brilliantly reharmonizing the melody differently each time. Each rendition was unique, and probably would have taken the most accomplished of guitar players hours if not days… of work to master, but Ted improvised it all on the spot. He did this repeatedly and with casual ease” (104). In the quest to master his solo performance style, Ted Greene developed additional innovations in left and right hand guitar techniques. He trained his left hand to play double stops, a procedure in which a finger falls perpendicularly on the fretboard in the middle of two strings and stops both. Double-stop differs from semi-barre, a left hand technique that requires bending the phalanx backwards and flattening the fingertip parallel to the fretboard. In semi-barre, as a result of the finger’s length, the finger must depress at least three strings. With double stops, it is possible to depress only two adjacent strings while letting the ones below and above vibrate freely. This allows the guitar more flexibility in handling several voices, as the production of independent sounds on the guitar depends on the number of available strings. On the other hand (literally), Greene did not rely on a plectrum, so his right index was free to play an extra note. Typically, jazz guitarists hold a pick between the index and thumb, even when comping, although they can involve the other three fingers in the execution of chords. Thus, they can normally sound up to four notes simultaneously, but Green was able to sound five, a resource that gave him more freedom in voiceleading. This technique is common in classical guitar execution, but it is infrequent in the electric one. Greene’s facility on the instrument did not blind him from other aspects of music. An expressive artist, Greene handled a wide palette of tones. In the words of renowned guitarist Pino Marrone, one of Greene’s own students, the late master had “a gorgeous tone, and the delicate touch that made… notes ring like bells” (106). At the request of one student at the 1993 master class, Greene begins an improvised arrangement on “Autumn Leaves” alternating baroque and jazz vocabulary. For the baroque section, Greene switches from a warm, rounded sound, with emphasis on the low end of the sound spectrum, to a crystal quality, high-end timbre that resembles a harpsichord, suitable for the clarity of contrapuntal lines. Ted Greene’s ability for sound production is based on his awareness of two of its most important aspects: sound setup and performing technique. Regarding the former, in “Ted Greene – Telecaster Setup & Sound,” by Youtube user TedGreeneArchives, Greene explains how he customized his own telecaster to achieve his desired sound. The video shows a private lesson with student Nick Stasinos, where Greene elaborates on his setup: “the pick up is dropped… really low; the screws are out. That’s what we did to [John Pisano’s] guitar, to make it better. It gets rid of the mud, if you don’t want the mud. But it leaves some sparkle, because the bolt pieces are not [there]… I was doing this [in the 70s]” (2:01). Greene goes on to play an excerpt demonstrating the “crystally, glassy” quality of the sound, calling it a “Fenderish” tone, demonstrating his familiarity with several types of guitars and their sounds. Additionally, he gives advice to the student regarding the interaction between different types of pickups and strings: “the old [telecaster model’s] pickup with thick strings gives you a steel guitar tone… This [other option] is giving me some of the tele’s bang right now, ‘cause I got the thin, later [model’s] pickup with the raised magnets, with these big strings. So I use it to get that juice upstairs, that kind of thin air, but not obnoxious,” referring to the higher end of the sound spectrum (4:21). Additionally, in the workshop of December 14, 2003 hosted by California Vintage Guitar, Greene plays a variety of arrangements, each on a different guitar. Unfortunately Youtube videos of this workshop focus mainly on Greene’s performance, and so selected clips leave the guitarist’s explanations somewhat incomplete. Nevertheless, viewers of different videos of that same clinic can appreciate that Greene’s procedure in the class is to demonstrate different timbral possibilities with each instrument. Furthermore, he explains why a particular instrument enhances the sound of a particular selection. Referring to the guitars he has brought to the workshop, he says, for example in “Ted Greene–Playing the Blues–December 2003” by deparko: “The Gibson guitar is very polite, well mannered… not really suited for the blues. This [other] one’s a little unruly” (0:05). During the same video, Greene adds that the guitar is tuned lower than the standard configuration. Tuning is another factor that affects tone production, and lowering it enforces the low end. Greene’s album, as a matter of fact, uses alternate tuning. On the forum “Ted’s Tunings on Solo Guitar ,” from Greene’s website, a writer registered as Jerome, taking the information from Jim Hilmer, writer for Vintage Guitar Magazine, lists three different tuning sets used in the album, all lower than standard tuning and one of them a minor third lower. Greene’s knowledge of sound and technology propelled his development of tone. Yet, Ted Greene was aware of and used performance techniques involved in tone production, as well. One of them has already been mentioned: using the right hand fingers without a plectrum. Apart from sounding five notes at the same time, Greene was able to use his thumb to generate a warmer sound. This resource enabled him to play walking bass lines with a more rounded tone, a sound reflecting the lower end of the spectrum, because the human skin delivers less attack than a pointy plectrum when playing a note. In addition, in his method book, Modern Chord Progressions , Greene instructs students to pay attention to the position of the right hand for tone production: “Holding your right wrist up away from the guitar puts your fingers into a position where it is easier to achieve good tone… [J]ust start out with a moderate high (about 2 to 3 inches… Incidentally, if you play with a thumb pick, you won’t be able to hold your wrist up as far and, in fact, you may not find it desirable to hold your wrist up at all” (6). A subtle clue in “Ted Greene – Telecaster Setup & Sound” hints at Greene’s awareness of the difference between plucking the strings on the neck position, to produce a warm sound, or on the bridge position, to emphasize the high end: during the video, Greene says that the sound is influenced by a guitarist’s gear “as much as the touch,” and as he says “touch,” he alternates the position of his right wrist between both the neck and the bridge positions. While for classical guitarists, who do not rely on electric amplification or equalization, taking this difference into account is daily routine, for electric guitar players this awareness is quite uncommon. [o]ne of the first things Ted did when [trying out] a guitar… was figuring out in which register it sounded the best. So, he would play progressions all over the neck, noting things like, “triads on the middle strings sound really fat around the 9th fret” or “listen to the harpsichord-type tone above the 12th fret”. While doing this, he would also try all the various pickup combinations. It was an almost scientific way of evaluating tone… Ted would often realize that a guitar would sound better in a different pitch [tuning system]. A restless explorer of timbral possibilities, Ted Greene was a master at the execution of artificial harmonics. As Larry Coryell noted in “Vibrant Voicings,” Greene “was one of the first to use artificial harmonics in an advanced way” (110). In the technique to play artificial harmonics, while a left hand finger depresses a string, the right index is laid softly twelve frets above that note (one octave higher), on the same string. Then the right thumb plucks the string, and the resulting sound is the first harmonic in the overtone series, the pitch one octave above the fundamental note. Because harmonics are sine waves, these notes sound like bells. Nevertheless, Greene does not play artificial harmonics in an isolated manner. He mixes both harmonics and regular notes into musical phrases, either in arrangements or improvisations. Furthermore, Greene generates an even texture by bringing both harmonics and regular notes together into a balance of articulation and volume, and he handles the regular notes flexibly by the legato articulations hammer-on and pull-off. The combination of rapid flexibility of regular notes and sine-wave purity of harmonics results in phrases with a tone as delicate as a harp’s. Ted Greene was an accomplished and innovative musician, and perhaps his musical development makes it more surprising that in his profession he was mainly a teacher. In the California Vintage Guitar master class of May 18 of 2003, he says: “when I see my name in printed cases, they always call me a jazz player, and I definitely like jazz a lot, but it seems that when I look at my background, most of my time… has been spent on research… I didn’t mean to be a guitar teacher, I just fell in love with it” (9:30). Indeed, as an instructor Greene could convey the same humanity as he did as a performer. Ted Greene’s master classes show his interaction with groups of students. Greene is humble and natural, taking every one of the crowd’s ovations with a humility that is close to shyness, expressing the same attitude by his body language. These traits present him as an approachable person, and thus the students are able to trust him and communicate with him. Greene shows himself as a very open minded person, and rather than centering his discussions on topics and concepts, which he also transmits clearly, he focuses on empowering students to go their own way and challenge established tendencies. In the “GIT master class of 1993, part 2”, Green discusses tonal centers while vamping on an A minor Dorian progression: “if we vamp to a chord like this,” he says while playing a specific voicing, “our ears say that we are in the key [of A minor Dorian] still… Now, the one note that we’d be really surprised to be playing… would be, what?… C sharp… right… but here [it] is,” he says showing the major third hidden in the middle of the voicing. Then he goes on to tell his students that concepts and knowledge are “all good stuff” but “can inhibit you sometimes from seeing the big picture… Don’t think any notes are bad… Everything’s in the key; everything’s in every key… It’s just an effect” (0:30). Above all, Ted is one of the very few musicians I met who was a living example of the dignity and beauty of the teaching career as a way of life, not just as a means of making a living. This played a huge part in my becoming a guitar instructor (106). The wealth of info and technique in [Greene’s] books will always be the standard escape route for any player who wants to break out of ‘the box’ on guitar. Chord Chemistry is a book that will live forever (107). For the last couple of years I invited the ever-humble Ted to GIT to teach. He was hesitant at first, because, believe it or not, he was concerned that nobody would be interested in what he was doing! Quite the contrary… he would hold court with students limitlessly for hours on end (107). Ted was an ocean to learn from. One thing that made his playing especially beautiful was his humility and his pure love for music… He was the eternal student, forever inspired and never feeling like he had mastered the guitar (110). Greene, Ted. Modern Chord Progressions . Van Nuys, CA: Alfred Pub. Co., 1985. —. Solo Guitar . Art of Life Records, 1977, 2005. —. “Vibrant Voicings.” Guitar Player . Ed. Adam Levy. Nov. 2005: 104-110.